Looking for the best Dog Walking trails around Durango? Find the top rated dog walking trails in Durango, whether you're looking for an easy short dog walking trail or a long dog walking trail, you'll find what you're looking for. Click on a dog walking trail below to find trail descriptions, trail maps, photos, and reviews. My husband and I rode this trail from the north end (parking along the street behind City Market), but there is a parking lot further north on River Bend Rd. This trail is about 75% concrete and 25% asphalt in need of some repairs. But over all it was a great trail along the Animas River through parks and neighborhoods. Easy to moderate. Watch for people coming into trail on foot. Many places to stop along the trail to sit by river or have a beverage. I rode this trail with one of the local tour outfitters. (There are at least two companies that organize bike tours out of Telluride and Mountain Village.) I highly recommend doing this, especially if you are new to mountain biking like I am. The guides haul everyone's bike up to the Lizard Head Pass trailhead, and from there it is downhill to Iium. Those caveats aside, this was one of the most memorable bike rides I've taken, and the scenery is spectacular! I would do it again. Started at the south end, parking lot across the river behind Home Depot. It had rained/misty conditions, and did not encounter many people. To label this RailsTrails might be misleading where I started; you expect that at most you encounter a slow grade increase or decrease with R to T, but the first 3 miles included several hills to travel up or down the river bank. Then the trail levels out though I turned around about 7 miles. STILL quite scenic, concrete sections very smooth, and asphalt sectins a bit bumpy. 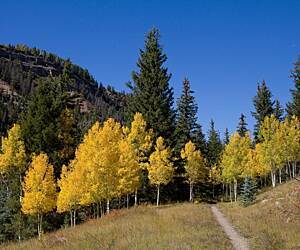 The bike shop in Telluride runs guided trips and shuttle on this trail. 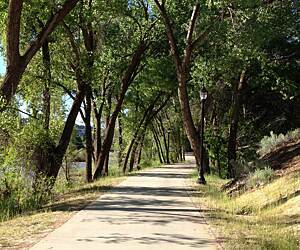 The Animas River Trail, as its name implies, is a paved trail that runs along the Animas River for about 7 miles (one way). We started the trail at the La Plata Fairgrounds and headed north into town. The trail through town is narrow and is busy with cyclists, walkers, joggers, and people pushing baby carriages. You need to pay attention on this section of the trail because it also has a number of large cracks and tree roots on the path. If you are a history buff, there are a number of interpretive signs along the trail. There are also a number of restaurants and cafés along this section of the trail. The trail also passes through several parks. The trail passes through Santa Rita Park which has a visitor center and nice areas for picnicking. The trail continues on for about 3.5 miles from the park and this section of the trail is the best. The trail looks newer. It is wider and has more ups and downs than the northern section. The trail ends abruptly at a scenic overlook. Overall, it was an enjoyable ride. Rode this trail 3 days straight in late July. The north end which is bordered by the Animas River and downtown businesses can be a little congested but is still very scenic and enjoyable. Head south east out of town and you can get up a head of steam and enjoy some short climbs while still following the river. This trail cost the Colorado Tax Payers a few bucks with dedicated bridges and mostly concrete pathway. It is first class all the way and I wish there were more trails done with the attention to safety and detail this one has gotten. Rode the trail end of July, 2012. We parked at the Visitor Center and rode out both ways and back. Loved it. Very scenic along the river and easy to follow. Plenty of interesting stops. Surface is good. A few large cracks to watch for. We were riding hybrids. Beware of not-so-smart people with babies sitting in lawn chairs under shaded bridges on the trail along the river in town. This trail is highly used. this is a peaceful river ride. some parts of the trail were closed, but it was not a problem. If you look at the maps on the side of the trail, you can usually see where you need to go to get past the area being worked on. I saw two 'speedo torpedo's' all angry and complaining like petulant little kids about the trail being closed. Many short steep grades. Except for the root heaves and cracks, mainly south of US 160 bridge, this would be a 5 star Trail. Excellent Scenery, Historical Signs and Facilities. Watch the River Trippers on Rafts, Kayaks, & Tubes as you ride along side, or from the bridges.